MEAN WELL UMP-400 400W Fanless Power Supplies, available now from Mouser, use a fanless, low-profile design to protect medical and industrial equipment from short circuits, overvoltage, overload, and over temperature. 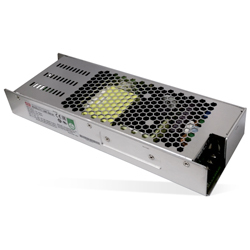 These power supplies offer a modular 1U design with optional configurations possible, a power-on LED indicator and a three-year warranty. The devices have a -30C to +70C working temperature with convection cooling. These devices are ideal for diagnostic or biological facilities, test or measurement systems, industrial automation machinery, industrial control systems, telecommunications equipment, and mechanical and electrical equipment.